Zac Efron was spotted making his way to a studio in New York City on Monday (August 17) for a guest appearance on ‘Good Morning America’ to promote his latest movie, ‘ We Are Your Friends’. 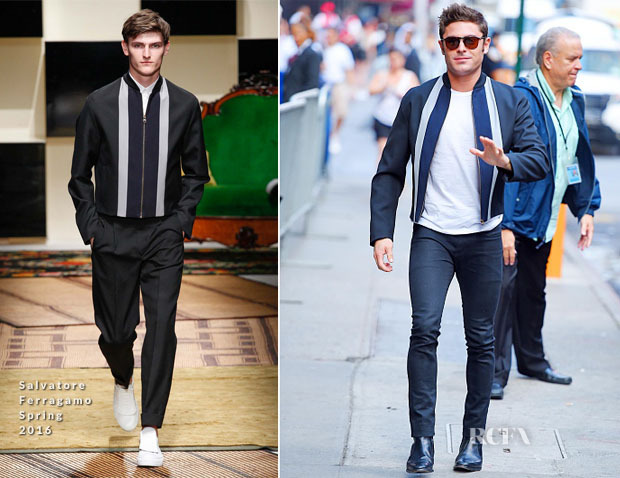 Continuing his black jeans and Chelsea boots combo, the actor wore a Salvatore Ferragamo Spring 2016 tailored bomber jacket infused with sporty stripes. Brimming with everyday ease and rebellious attitude, this was a well-rounded smart-casual look.